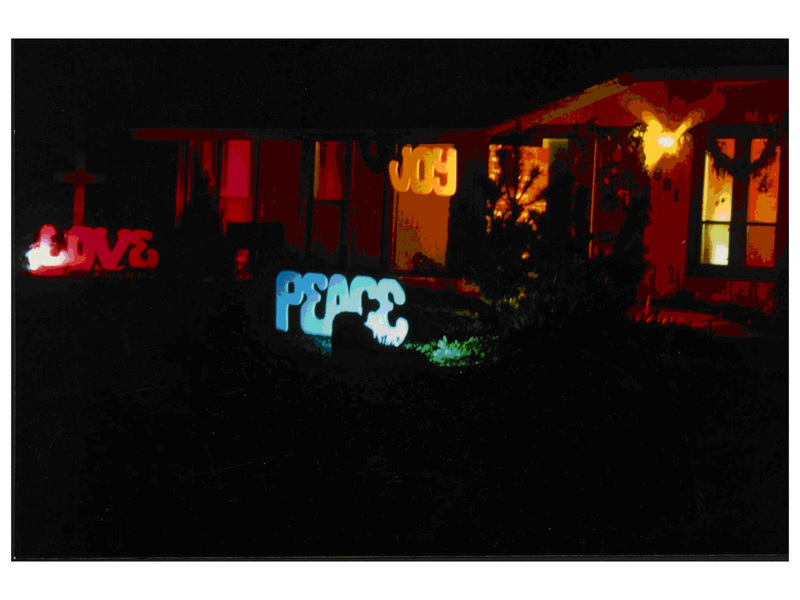 Giant-sized “LOVE, JOY, PEACE” signs with a wooden cross have adorned our home each Christmas season for the past twenty-four years—that is, until someone stole the “JOY.” Sometime during the night of December 2nd, a thief clipped the wires and escaped with the large sign. Through the years, we’ve grown accustomed to motorists as well as pedestrians slowing or stopping to contemplate this unusual Christmas message--the fruit of the Spirit with the cross. We’ve become identified as the “Love, Joy, Peace” home in the neighborhood. Parents have told me their children ask to go see the “Love, Joy, Peace” house, and, a few times, we have received notes of appreciation left at our door. Why would someone steal a “JOY” sign? My wife, Joanne, a Psychiatric Nurse, suggested that perhaps the thief was depressed and thought stealing ‘JOY’ would cheer them up. When I shared this story during a Christmas message, Tom, an agnostic and skeptic, was in the audience visiting church with his ex-wife. Bitter and disappointed, Tom’s life had been hard—a grade school drop out, compulsive gambler, drug user, and recently released from federal prison. Despite his hardened exterior, Tom had a tender spot inside. It was not uncommon for him to give a needy person his last dollar or to pay for the meal for a complete stranger. His ex-wife, Edyie, a petite beauty and former Hollywood model, asked if I would be willing to meet with her and Tom. Even though their marriage had ended several years earlier, she continued to have a burden for Tom to come to Christ. The three of us began to meet, and Tom, quite unwilling to change, persisted in his skepticism and rejection of Christianity. After about three months of meeting together, I began to wonder if he would ever respond to the gospel. During one of our appointments, the subject of the Christmas signs came up, and Tom offered to make me a new “JOY” sign. Delighted with his willingness to help, I brought him the two remaining signs, “LOVE” and “PEACE,” to use as patterns for the new “JOY” sign. A carpenter by trade, Tom worked in his spare time on the signs. While he was cutting and painting, the Holy Spirit was at work on his heart. Tom began to think, Where do love, joy, and peace come from? Suddenly, it hit him—there is no love, joy, and peace without God. He became so convinced of this, he took the extra plywood and made a fourth sign that said simply, “GOD.” He called to tell me the signs were ready, and I arranged to take him to dinner as a thank you. Before our meal was served, Tom blurted out, “I get it. The key to love, joy, and peace is God. I want to become a Christian right now.” He had heard me explain the salvation ABC’s backwards so many times, he said, “I know exactly what I need to do: confess my sins, believe in Jesus Christ, and accept Him into my life.” Tom prayed a stumbling, sincere prayer: “Hi God. This is Tom. Remember me? I live in La Crescenta . . .” I wondered if he was going to give God his driver’s license number so the Almighty could look up his record. He continued, “I know I am a really big sinner, and I haven’t had much use for you. I’ve made a mess of my life, and I need you to take over.” Overflowing with joy after his first prayer, he couldn’t wait to call Edyie the great news, and a few weeks later, I had the joy of baptizing him. We may never know who stole the Christmas “JOY,” but we do know this: no one can take away our joy—joy that is unspeakable, unstoppable, and un-steal-able!